Tulip time: Spend your money wisely. It’s a decision. 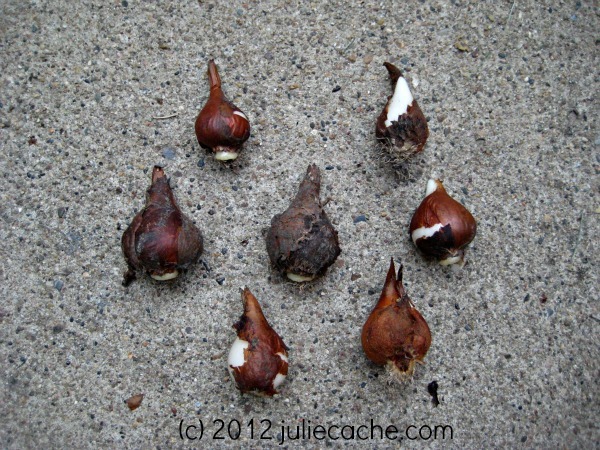 I just dug up my tulips this week. They don’t like to lay the way I want them to for photography purposes. This weekend is Bulb Mart at the Botanical Center. The Botanical Center is a government-run organization, and the Friends group that supports it is a small, non-profit volunteer group. When I saw that my fall-flowering crocuses (colchicum) were sending out leaves, I knew that I should start looking at dates for this year’s Bulb Mart. If the Friends were holding one this year, I wouldn’t want to miss the sale. I walked away from the bulbs at a larger store, but the itch was hitting me hard to buy something. Now this blog post could go a couple ways — the garden story, or the money story, and I’m choosing the money story. I’ll share my garden story later. It’s a long-term project. 🙂 I’m not writing this to applaud myself, but to encourage you to ‘vote’ with your dollars. My husband and I both grew up with self-employment in our families, my mother purposely chose a local business over a chain for my wedding cake, and Mr. TellBlast and I continue to work for ourselves and local non-profit groups. Your money makes a HUGE and extremely impactful difference to this group of people. So why did I visit a Starbucks instead of the locally-owned coffee house yesterday? I know what you mean. Since taking up a seasonal job at Victoria’s Secret, I have met many struggling workers. Bright people, nice folks. I go to Starbucks (or shop at the mall) every now and then because employees there are our neighbors, and currently not in a situation to work with or have a locally-owned business. I don’t have a lot of dollars to spend, so the dollars I do have require a decision, and I want that decision to be right for me. So I can sleep well. This entry was posted in etc., frugal family, religion stuff and tagged garden. Bookmark the permalink. 1 Response to Tulip time: Spend your money wisely. It’s a decision. Thanks for reminding me, I need to get my tulips. Hopping this morning!